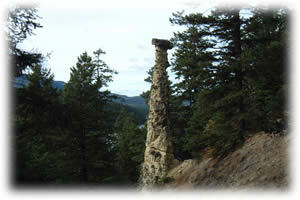 The primary role of Pillar Provincial Park is to protect a unique conglomerate stone pillar. It’s a beautiful place to take a walk and view the distinctive rock formation. The trail is steep and takes about 15 minutes to reach the Pillar. This park is located 11 km northwest of the community of Falkland, situated across the Falkland-Chase Road from Pillar Lake where there is a recreation site managed by the Ministry of Forests, Lands, and Natural Resource Operations. The primary role of Pillar Provincial Park is to protect a unique conglomerate stone pillar. The management plan for Pillar Park was approved in January 2014. The trail is steep and takes about 15 minutes to reach the Pillar. Please bring your own drinking water as potable water is not available in the park. There are pit toilets available in the park.